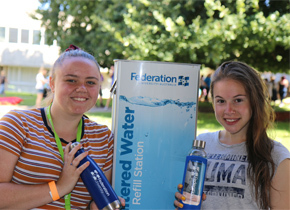 Federation University Australia will ban the sale of single use plastic water bottles on all of its university and TAFE campuses across Victoria in 2019. Director of Campus Life Colin Marshall was joined by first-year university students at the Mount Helen campus to make the announcement on the first day of Orientation Week (O Week). Under the ban, bottled water will no longer be sold in vending machines, food outlets or shops on the university’s Ballarat, Berwick, Gippsland or Wimmera campuses. Instead, students and staff can either bring their own reusable bottle or buy a high-quality reusable glass or metal water bottle that they can fill up for free at drinking water stations to be installed across all campuses. This will help stop around 18,000 plastic water bottles from ending up in landfill, waterways or the environment every year. The University will work with the Student Senate and staff on the roll out, with all campuses to be plastic water bottle free by the end of 2019.